Q. Coopers main beer brands since the beginning have been its excellent Sparkling Ale and Extra Stout. From our reading it appears that these have been brewed continuously from Thomas Cooper in the 1860s through to the present day. Do you know how long these beers have tasted the way they taste now? Are we drinking much the same beer your father, grandfather, great grandfather and great great grandfather brewed? A. Fundamentally, yes. Our production methods have certainly changed over the years as we moved away from fermenting beer in wooden puncheons to modern bulk fermentation and maturation in stainless steel tanks, but the characteristics of the beer have remained the same. Coopers Sparkling Ale and Extra Stout are still made from natural products without preservatives or additives and follow the same basic recipe that Thomas Cooper used back in the 1860s. While it is impossible to taste the Sparkling Ale and Extra Stout that Thomas Cooper brewed back then, we are pretty sure today’s versions are very similar. In fact, today’s Ales are probably far more consistent in flavour as modern brewing methods have largely eliminated any chance of contamination or “wild” yeasts affecting batches. To ensure consistency, Coopers still conducts weekly tastings of its products. Q. What was life like for you growing up as a Cooper? Were you intensely aware of the traditions and was there any expectation that you would end up working in the brewery? A. I was certainly aware of my heritage. My father, Bill, joined Coopers in the early 1960s, so since early childhood I was immersed in the brewery. Bill used to take us with him on his visits to the brewery on Saturday mornings to check the brews. Bill became Managing Director in 1977, but there was never any expectation on my part that I would end up working at Coopers. In fact, I was actively discouraged from it. In the early 1970s Bill told me there were doubts about the long-term future of the brewery and to get another profession. 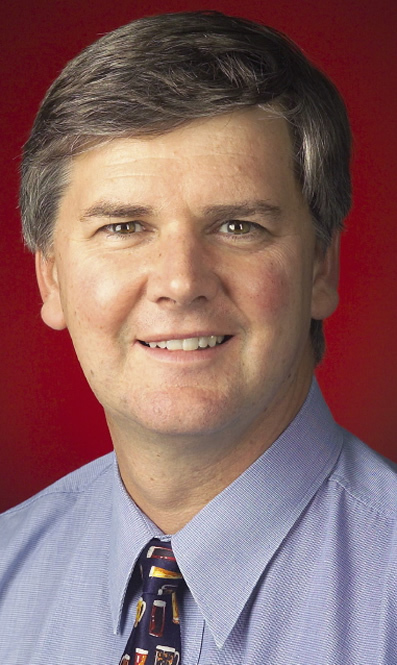 As a result, I studied medicine and graduated from the University of Adelaide in 1980. I then went to England and studied to become a physician specialising in cardiology. In 1986, I was told there may be a possibility of a position at the brewery which was really the first time I had seriously thought about it. As a result, I took a year off to study brewing at Birmingham University before returning to medicine, eventually joining Coopers in 1990 as Technical Manager. Q. Was it a difficult decision for you to turn your back on medicine to try your hand at working in a brewery? Surely that’s a wife’s worst nightmare! A. It was a very difficult decision. I was only two to three years away from completing my training, becoming a qualified cardiologist and moving into private practice, so there was certainly a lot to consider. I was also married with a daughter and another child on the way. For the first three or four years after joining Coopers, my wife Barbara and I wondered whether we had made the right decision, but everything appears to have turned out for the best. Q. Some 15 years have passed since you first joined the brewery and you are now both Coopers’ Managing Director and Chief Brewer. Personally, what over your time at Coopers are you most proud of? A. Without doubt, overseeing the design and construction of the new brewery at Regency Park. By the mid-1990s, the old Leabrook Brewery had reached maximum capacity and could no longer sustain our growth. The only solution was to move and in 1997 Coopers purchased some 17,000 square metres of land at Regency Park, an area that had been previously used as a bus repair facility. With a team of civil engineers I developed the preliminary design and budget for building a $35 million brewery, which the Board approved in 1999. I was given the job of designing and planning all aspects of the brewery to enable us to expand our operations for the next 100 years. This was a major risk for Coopers and required us to break out of our comfort zone and take on significant debt. Part of this was a 10-year loan from the South Australian Government that we paid back some seven years ahead of schedule. The new Regency Park brewery was officially opened in November 2001, 120 years after Thomas Cooper had opened the Leabrook brewery. Regency Park has been designed to produce up to 225 million litres of beer a year, about five times the company’s production when we moved. It was also designed to be as environmentally friendly as possible. Among its features are energy recovery systems, a water treatment plant that utilises acquifer water rather than water from the mains system and a natural gas powered cogeneration plant that exports excess electricity into the State power grid while using waste heat to provide our steam needs. While the move from Leabrook to Regency Park provided us with some initial teething problems, these were overcome relatively quickly. Since opening at Regency Park, we have spent another $30 million on new plant and equipment to cope with our rapid growth. Q. When recently in Adelaide, an older cabbie was of the view that in his day Coopers was seen as an old man’s beer and that the young all drank lager (which was consistent with national trends). And yet it now appears that drinkers in Adelaide drink Coopers’ beers without even thinking about it – it’s just what they drink. If this was true, obviously there was a happy move “back” to Coopers traditional English styles by South Australians some time in the past 20 or so years. Why and when do you think this happened? A. It’s certainly true and very pleasing that the youth of Adelaide has rediscovered Coopers, but it’s not something that has been confined just to South Australia. Throughout Australia, consumers are increasingly demanding premium quality beers. In fact the premium end of the market is the only segment of the Australian beer market that is currently showing growth. Coopers has always positioned itself in the premium end of the market and as a result has been able to ride this trend. The turnaround in Adelaide was probably due to a combination of activities. From the mid-1990s under the direction of my cousin Glenn, Coopers Chairman and Marketing Director, we began targeting the university bars and trendy outlets of the city, working on getting our beer on tap. Glenn and our advertising agency, KWP! also began creating a quirky image around the product with the “cloudy but fine”, “Handmade by the Cooper family” and “The dark side of the family” campaigns highlighting Coopers points of difference. This was supported by our move to the new brewery, which enabled us to ensure quality and consistency of product. Coopers Pale Ale in particular benefited from these activities and now is our best selling line among younger drinkers looking for an alternative to the beer their fathers enjoyed. Q. One beer we found particularly delicious in our recent visit was the Extra Strong Vintage Ale. Is this your creation as Chief Brewer and will Coopers continue to produce it? How would you describe it? A. Extra Strong Vintage Ale is certainly one of the products I worked on with our team of brewers. We first produced our first Extra Strong Vintage Ale in 1998 and it sold out in five days. Subsequent vintages were produced in 1999, 2000, 2002 and 2004, which was probably the beer you tasted and the one I believe is our best to date. Each of the vintages has become a collector’s item and is designed to age well and be enjoyed after prolonged storage. Stored under cool cellar conditions, the 2004 vintage will become more complex and interesting in flavour for another year or so, although, as you noted, it is very good drinking at the moment. Vintage Ale has a strong malt character, having been brewed with a selection of barley and wheat malt and specially coloured malts, balanced by a triple hopping with Hersbrucker, Cascade and Pride of Ringwood hops. It was pitched with a double pitching of two yeast strains and underwent an extended primary fermentation. It was then pitched again with a specially nurtured yeast, which had been vitalised to enable longevity of bottle conditioning. It is also strongly alcoholic with 7.5% alcohol by volume, which adds to the flavour. Although we did not release a Vintage Ale in 2005, we are certainly considering a new release in mid to late 2006. Q. Can you tell us a little about the “Best After” date on Coopers bottles – something that delights those drinkers interested enough to notice. When was it introduced? Does that date indicate the time all of the yeast in the bottle should have consumed all the sugar? Do you add a little bit of sugar and yeast to the beer just before you bottle it? How long does it take for this bottle fermentation to occur? Do Coopers beers not go “off” like other beers do (and hence not need a ‘best before’?) Did this bottle fermentation used to occur in storage prior to bottling or has it always been a feature of Coopers beers? A. The main reason any beer deteriorates is oxidisation. Pasteurised beers such as lagers begin to deteriorate immediately after bottling and are best drunk fresh. Naturally conditioned ales, such as Coopers, are not pasteurised and contain live yeast that mops up dissolved oxygen. As a result, these naturally conditioned ales age and have a far longer shelf life than lagers. The “Best After” date is a product of this difference and follows the introduction of “Best Before” dates for all food products in Australia in December 2001. Ahead of these regulations, Australia’s brewers met to agree on the shelf life for beer. For pasteurised beer, this shelf life was determined to be nine months. However, because Coopers ales contain “live” yeast and age slowly, they was exempted from the need to carry a “Best Before” date. I decided that Coopers should carry a “best after” date for its ales instead, partly to highlight the difference between its ales and lagers, and, as you point out, to create a point of interest. This date indicates when the ale has completed its secondary fermentation within the bottle, although Coopers stores its beers in its warehouse until this date has been reached before distribution. As you suggested, secondary fermentation involves the addition of a little sugar and yeast to the ale before bottling. The sugar is converted by the yeast into carbon dioxide, which produces the “head”, and a little extra alcohol. It is the same process used in the production of good quality sparkling wines, such as champagnes. Q. Do you think that Coopers is now in a golden age as it was in the 1920s, or is the best yet to come with more national and international awareness and the growth of the premium beer sector? 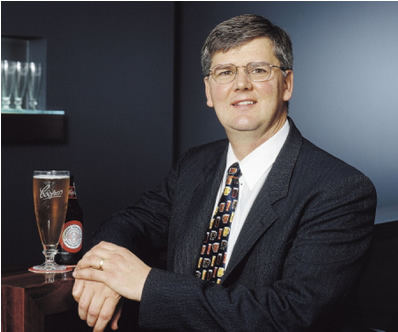 A. I believe that Coopers is in the early stages of a period of substantial growth and the next few years are likely to be very exciting indeed for the brewery. In 2004-05 sales were up almost 18%. Interstate growth was 34%, while export sales were up 17.3% in 20 countries. At the same time, Australian beer sales overall declined by nearly 1%. We are anticipating that 2005-06 will continue in much the same vein. Production will almost certainly pass the 50-million litre mark for the first time. In South Australia, Coopers now has more than 24% of the market while nationally it has around 3% with plans to boost this to more than 5% in the next few years. The premium beer market is the fastest growing market in Australia, growing at 15% a year and Coopers has outperformed its competitors in this segment. A. I think the recent hostile takeover bid launched by Lion Nathan for Coopers answers that question fairly forcefully. The fact that our shareholders voted 93.42% to 6.58% to remove Lion Nathan from the Coopers constitution, a step that all shareholders knew would virtually end the takeover bid, demonstrates that our shareholders have great confidence in the current Board of Coopers and want to share in the heritage and tradition, as well as the future of their company. Q. Finally, do you think that there will be a 6th generation of Coopers to carry on what must be Australia’s greatest brewing tradition? Who are the prospects? Without a doubt. The descendants of Thomas Cooper strongly identify with the heritage of the company and I believe there will be a number of suitable candidates from the sixth generation when the time comes. However, they will have to do something else and prove themselves outside the brewery before being considered. Being a Cooper does not automatically mean there is a position waiting for them within the company. Glenn and I both established careers for ourselves outside Coopers before taking up positions within the company and our successors will have to do the same. A number of sixth generation Coopers have already worked in a part-time capacity at the brewery including Glenn’s son Andrew, Amy and Joe Seppelt, and my daughters Louise and Sarah, but the next leaders at Coopers may well come from any of the extended family. AustralianBeers.com would like to thank Dr Cooper for answering these questions, and for his family's brewing efforts since 1862. ** We asked this question before we knew of the Lion-Nathan takeover attempt.